THE BEST PAINTBALL PRO SHOP IS HERE IN OHIO! At Paintball Ohio, we offer a large selection, great service, and low prices. Stop in for all of your Paintball, Airsoft, and Skateboard needs. We look forward to seeing you soon. 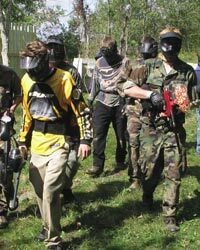 Our affiliate, SplatterPark Paintball Games is the premiere paintball facility featured on the X-BOX, PS2 and Nintnedo video game Greg Hasting Tournament Paintball. Paintball Ohio now offers Sodastream tank refills for only $4.99. That's over a $10 savings compared to the standard exchanges offered elsewhere. Stop in for your tank refill today. race car shifter tanks - while you wait. Paintball Ohio now offers Sodastream CO2 Tank Refills for only $4.99. This is the best deal on Sodastream Tank refills in Columbus and Central Ohio. Have you tried WREK Elite Paintballs? Like to buy your paintball gear online? - visit our affiliate to find all your paintball gear. Copyright � Paintball Ohio & Central Ohio Paintball, inc.